This story by Jonathan Morris sees the Doctor and Evelyn in contemporary London, where they find themselves under attack from robotic insects. One such encounter brings them to the attention of Menzies, who knows the Doctor of old, even though he doesn't know her yet! Menzies is down in London following the investigation of a mysterious gangster called 'The Doctor'. And given the odd activities of this strange man, even the Doctor is forced wonder if he is a future incarnation. Of course it isn't and anyone who has read the title of this story will work out who is behind it. The gang boss is actually one Thomas Brewster and soon everyone finds themselves caught up in his machinations that have gone horribly wrong. Again. One of the strongest points of this story is the appearance of Anna Hope as Menzies, someone who put in strong appearances in two previous adventures. Hope brings a dry wit and sarcasm to Menzies which I really enjoyed and she sure doesn't disappoint here, with more fun to be had when she realises the Doctor hasn't met her yet. Luckily, with her chats to Charley, she knows what a bad thing this sort of thing can actually be. It is a shame then that the story doesn't actually give her much to do. She does a little investigating with the Doctor for a while in the middle of the story but once everyone is whisked off to an alien planet, she becomes another character who stands around and asks questions. I suppose what made her first two adventures so brilliant was that they were straight police procedurals with sleaze and intrigue that saw aliens thrown into the mix for good measure. 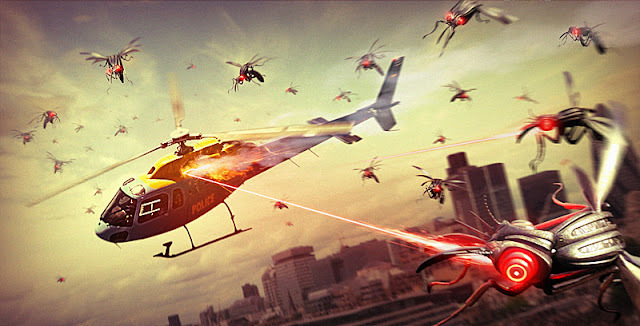 This is a story which is another average fighting aliens tale and in this kind of setting, nothing is really interesting. Still, she gets good comedy material in, especially when she gets to the alien planet! Really though, for a story which features four companions from the past, present and future, it is really uninterested in any of them. Maggie Stables does get some brilliant moments as Evelyn, criticizing the Doctor's coat and infiltrating a gang. But once she arrives on the alien planet, she is the one who gets possessed by an alien consciousness. And the idea of Brewster trying to be the Doctor was one with some interesting potential, when the real Doctor shows up, it is shoved aside and he is forced to stand to the side and get moaned at. And there is another interesting character who turns out to be pointless in the form of David Troughton's, Raymond Gallagher. He too is a London gangster but ends up as your everyday, generic Doctor Who character, even though Troughton really makes him work. But when episode three comes around, he is separated from everyone else with no one interesting to talk too except some goon and a robotic insect. Sadly all the characters here are pretty forgettable, like the sergeant helping Menzies and the two folks who play the ordinary folks in danger part. 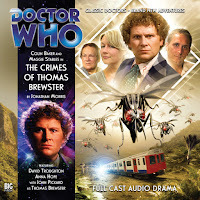 The story featured in The Crimes of Thomas Brewster is alright I suppose but it is a fairly average tale of battling aliens to stop them from reaching Earth. And it feels like not a lot happens. Things and people come and go here and there but it gets lost in its technobabble conclusion, which was where the story lost me completely.